Professor Heinz Wolff is a highly respected scientist and public figure. He is probably best known in the science world as 'inventor' of Bioengineering and to the public for his television and radio work over the years, including such series as BBC's 'The Great Egg Race'. After leaving school in Oxford he worked for four years at the Radcliffe Infirmary at Oxford and at the Pneumoconiosis Research Unit near Cardiff, concerned with the design of medical and environmental measuring equipment before reading Physiology and Physics at University College, London. Graduating from University College, London in 1954 with 1st class honours, Heinz began his career in the Division of Human Physiology at the National institute for Medical research, and in 1962 he founded and became the Director of the Biomedical Engineering Division. Since 1975 he has held a number of honorary positions with the European Space Agency including chairman of the Microgravity Advisory Committee. In 1954 he 'invented' Bioengineering - a term used to describe an activity designed to make the huge advances which had been made in technology, during the Second World War, available to the biological sciences. He was in turn director of the Division of Biological Engineering at the National Institute for Medical Research and of the Clinical Research Centre, of the Medical Research Council. For over 30 years he has been involved with Television and Radio, and in this field is mainly remembered for series such as 'The Great Egg Race', 'Young Scientists of the Year' and 'Great Experiments Which Changed the World'. He passionately believes in the importance of technical and scientific education for young people and in getting them to think of the social and ethical consequences of advances in these fields. In 1983, he founded the Brunel Institute for Bioengineering, which became the only organisation in the UK to work on the instrumentation problems of conducting biological research in the weightless environment of a spacecraft. The Institute is financially totally self-supporting and holds contracts for work in space research, medical instrumentation and technology for the improvement of the quality of life for the elderly (Tools for Living). In connection with the latter activity, Professor Wolff was given the Harding Award for 1989, awarded alternately by Action Research and RADAR. In 1992 he was the recipient of the Edinburgh Medal, awarded in recognition of an outstanding contribution by a scientist to society. In 1987 he was made a Fellow of University College, London, and in 1989 a vice-president of the College of Occupational Therapists. In 1993 he received an Honorary Doctorate from the Open University and in 1993 was made a Fellow of the Institution of Electrical Engineers. In 1994 he was made a Fellow of the Biological Engineering Society, and in 1995 received an Honorary Doctorate from De Montford University, Leicester. In 1999 he was given honorary Doctorates by Middlesex University and Oxford Brookes University, and was made an honorary fellow of the Royal College of Physicians. 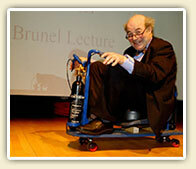 He is now Emeritus Professor of Bioengineering at Brunel University but does much the same as he did before. His personal interests range from the invention of high technology devices to the widespread and sensible application of technology to the problems of the elderly and disabled. He regards the communication of enthusiasm for science and engineering to the young as a very high priority. 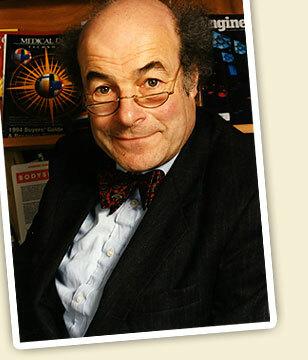 Heinz Wolff is an entertaining and humorous speaker and an expert in a specialised, fascinating and mind-blowing subject matter. During his after-dinner speeches he has been known to carry out 'experiments' at the table and on one occasion he made aluminium - highly original! Professor Wolff is much sought-after for television, radio and after-dinner speaking. Please contact us for more information and availability.